A very happy anniversary to the Monkeys!!!! happy anniversary! can't wait to hear about dinner! Happy Anniversary to Mr. & Mrs. Monkey! happy anniversary! the plate made me hungry! i think i'll polish off the rest of the cheesecake i made last night. if i put strawberry puree on top, that makes it healthy...right? Happy Anniversary to you and the Mr. Hope it was a good one. 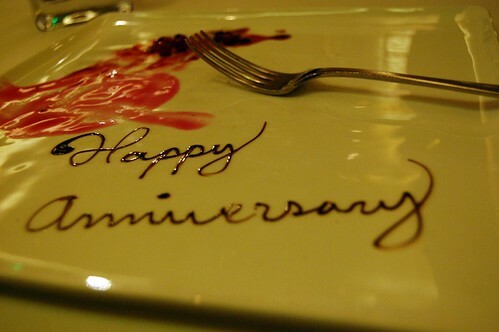 Happy Anniversary to you! Hope you two had a nice time. AND MAY YOU HAVE MANY MANY MORE!!! happy 'versary! can't wait for the review, because i was contemplating it for my birthday dinner. I have my fingers in my mouth and I'm whistling whistling whistling! THAT'S how excited I am for you. a happy belated anniversary wish to you both! Happy Anniversary! We celebrated our 18th today at Wokano on 7th (nice to be able to walk!). It was nice (your meal looks amazing! ), but like you say, "it's about the company". How do you always take all these great pictures at restaurants?!? I'm always feeling "funny" snapping away at my food! Even though I've been doing it covertly for years, you seem to have "no fear"?!? What's your secret? Thanks!